Don’t Call Me Kit Kat follows 13-year-old Katie Mills as she plunges into the depths of an eating disorder. A combination of things—things that most teens will encounter at one time or another—drive Katie to binge and purge, giving her a false sense of control. Many issues are touched on, ranging from cliques, bullying, jealousy, crushes, social pressure and underage drinking to divorce, body image issues, mental health and suicide. Someone close to me struggled with bulimia from the age of 12 into her mid twenties, so I know exactly what the disease does to a person—both mentally and physically. I drew from my friend’s experiences, as well as from memories of feelings I had as a teen, to create Katie’s story. 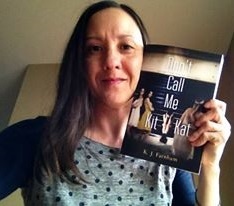 Don’t Call Me Kit Kat is my attempt to shed light on a disorder that is often not taken seriously as a life-threatening mental illness. Bulimia (like other eating disorders) is a complex disease with multiple causes and no clear course of treatment. Every bulimic needs different things to heal and heals at her own pace. Those who suffer often feel too ashamed to seek help. To make matters worse, friends and loved ones of sufferers tend to have a hard time understanding that treatment is a lengthy process, so lingering symptoms often get swept under the rug. It breaks my heart. The original title for this novel was The Me I See, but my editor and a trusted beta reader thought it sounded too self-helpish. At first, I didn’t agree, so I ignored their opinions. (I can be extremely stubborn at times!) When my editor questioned whether I’d thought about changing the title, I decided to post a poll on Facebook and was forced to open myself up to the possibility of a new title when others agreed that it made them think of a self-help book. This might sound silly, but I was devastated. So I allowed myself a few hours of sadness, and then I moved on to brainstorming for a new title. Like the title for Click Date Repeat, Don’t Call Me Kit Kat came to me while I was running on my treadmill. I wanted something original that would make people wonder why the title is significant. I wanted people to reach a point while reading when they’d think “Ah, now I understand the title.” I hope I’ve accomplished my goal! I wish I could say the beach or our local state park among the chirping Eastern Bluebirds and Scarlet Tanagers, but anywhere outdoors (especially on a sunny day) would be too distracting for me. So here’s the boring…um, I mean, the real answer. My favorite place to write is in my living room while lounging on the loveseat with my feet up. I place my laptop either on the arm of the loveseat or on a pillow on my lap. There’s usually one cat purring in my ear and another laying next to me. Oh my, this is a tough one! But since I’m from Wisconsin—the official cheesehead state—I have to go with cheese. Click HERE to view the entire feature, which includes the rest of the interview, Tess’ reason for choosing Kit Kat, and her review of the book. Click HERE to sign up to receive Tess’ monthly newsletter. Becoming a subscriber automatically enters you for a chance to win her monthly giveaways!